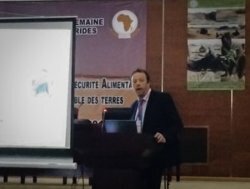 On August 27, 2014, the Association Scienza per Amore presented the Bits of Future: Food for All cooperation project at the Second Africa Drylands Week in N’djamena. The forum, organized by the Government of the Republic of Chad and by the African Union, explored the possibilities for increasing agricultural productivity in the African desert areas, closely linked to the problem of food security. Scienza per Amore’s participation at the event followed the official presentation of Hyst technology and its applications at the African Union’s headquarters in Addis Ababa, held on 31 July 2014 in the presence of Her Excellency Tumusiime Rhoda Peace, Commissioner for Rural Economy and Agriculture, and her staff. This technology, which was considered an example of best practice applicable to many African countries, has been chosen as suitable for the project dedicated to the Sahel and therefore ready to be presented at the Second Africa Dry Lands Week, directly to the relevant Ministers of the participating countries. 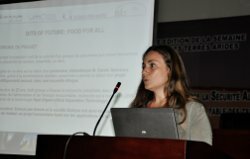 On this occasion, Barbara Carrubba, External Relations of Scienza per Amore, and Pier Paolo Dell’Omo, President of the Association, illustrated the guidelines of the Project and highlighted Hyst’s potentials in making the best use of dryland resources. The section devoted to the enhancement of some indigenous resources, in particular that of the water hyacinth, aroused great interest among the attendees. Native to South America, this invasive plant has long been creating extensive damage to the economies of African countries, impeding navigation, reducing fish populations and facilitating the spread of various diseases. The Hyst units, offered as a gratuitous loan by Bits of Future: Food for All to the countries concerned, can turn this problem into a source of food and energy. Similar results had already been achieved in the exploitation of other resources, particularly the by-products of the milling industry, to produce very high protien flour and iron, zinc and vitamin supplements. The presentations received approval from all the representatives of the Ministries and of the African governments attending the event, as well as the representatives of countries involved in the The Great Green Wall for the Sahara and the Sahel Initiative, in particular Chad, Mauritania, Mali, Burkina Faso, Uganda. The technical team of the Ministry of Agriculture and the Ministry of Livestock of the host country proposed to the Scienza per Amore representatives to start research immediately on exploring the value of other plants typical of the Sahel for food and pharmaceutical purposes. The concluding remarks of the event further emphasized the valuable contribution that Hyst technology could make to achieving the objectives of the project of the Great Green Wall. To conclude, the Minister of Agriculture and Environment of the Republic of Chad, H.E. BAÎWONG DJIBERGUI AMANE ROSINE, pointed out during the closing ceremony that the exploitation of natural resources, in particular those that today are a problem, can be a source of wealth and a tool for the sustainable management of drylands. These statements are in line with the Bits of Future: Food for All mission, aimed at providing a means to enhance local land resources. Such a development should stem from the activities of the countries themselves and the people for whom the Hyst units are intended. On the basis of these positive results, starting from the month of October, the Bits of Future road map will see the beginning of tests on biomass sent from Africa, in the presence of representatives of the Governments concerned. Following these actions we can hope for interventions from countries that are friends of Africa, which can contribute to the economic recovery of the continent to create a network of ever more mutual relations.